Never feel bogged down again by bad posture with the Knoll Life Chair. With its uniquely designed slim silhouette and flexible mesh back, the act of sitting is made comfortable again. Slender, sleek, and ergonomic to its core, you'll love the intuitive adjustment and recline features, sans all of the levers included on most office chairs. 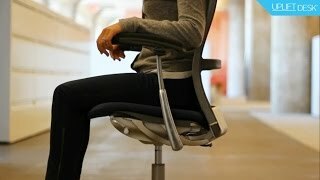 Sitting just got a whole lot simpler. The Life Chair's back adjusts with your body, and the chair's seat depth is adjustable to fit a wide array of users. Durable cloth mesh brings breathability and flexibility closer than ever, giving you an ergonomic seat that's as comfortable as it is supportive. Add the optional seat and back toppers for even more comfort you can count on. Arm height from floor Fixed arms: 25.375" - 30.5"
Adjustable-height arms: 22.25" - 31.25"
Distance between armrests Fixed arms: 17.75"
High performance arms: 17.25" - 19.75"
The Knoll Life Chair is available in three different types of armrests, or you can opt for no arms. Fixed arms do not adjust. They are available with plastic arm posts and an integrally colored thermoplastic urethane pad with a glass-filled nylon insert. Height adjustable arms offer a 4" range of height adjustment that goes 5.5" - 9.5" from the seat, and they feature grey plastic arm posts and integrally colored thermoplastic urethane pads with a glass-filled nylon inserts. High performance arms are height and width adjustable and they include armpads that slide forward and back with locked stops. These arms feature aluminum arm posts with an integrally colored thermoplastic urethane pad and a glass-filled nylon insert. Knoll Life chair arms are available in Sabrina or Volo Spinneybeck leather upholstery. This custom option will add two weeks to manufacturing time. Select from four low profile bases: black plastic, grey plastic, painted matte aluminum, or polished aluminum. The standard foam seat topper is 1.75" thick and upholstered in a wide variety of fabrics or leathers. The Knitted Seat Topper is Knoll's standard, base grade material. This lightweight and breathable fabric will keep you cool and comfortable throughout the day. The standard foam Seat Topper is 1.75'' thick. For added comfort, upgrade your seat topper to a 2.25" thick foam Ultra Topper. Both back and seat toppers snap quickly on or off the Life chair, making it easy to change the look of your chair as often as you'd like. The standard back topper is 3/4" thick foam. The back topper is available in a wide variety of fabric or leather choices to match your seat topper. A black urethane headrest can be attached to your Knoll Life chair to add extra neck and head support. The headrest features 3" of height adjustment along 12 positions, and is a perfect match to the chair's frame and arm rests. I bought this for the looks. After sitting in it I'm very happy it also is extremely comfortable. A Big upgrade from my previous chair. Recommend. I am very satisfied with the support provided by the Knoll Life Chair and the adjustability of it. The one thing that I would change is that there is no seat topper that is included with the basic chair. I assumed that there would be some sort of cushion associated with it and so did not order a seat topper. However, there is no cushion at all and, while comfortable, the seat gets very hard if you are sitting in it for a long time. I would recommend that some sort of cushion be included with the basic chair. When I retired, I couldn't bear to leave my wonderful Knoll Life office chair. I was delighted to find that The Human Solution offered all the options available for these chairs. At home now I'm still spending many hours at my computer, and the Knoll Life chair is keeping my back happy. Chair is very comfortable, but make sure you get the casters for hard floors. If you use a chair mat to move around on, the casters start peeling and make a mess! Very adjustable. Seat could use a little more padding but that may just be a mesh chair thing. Overall very good.